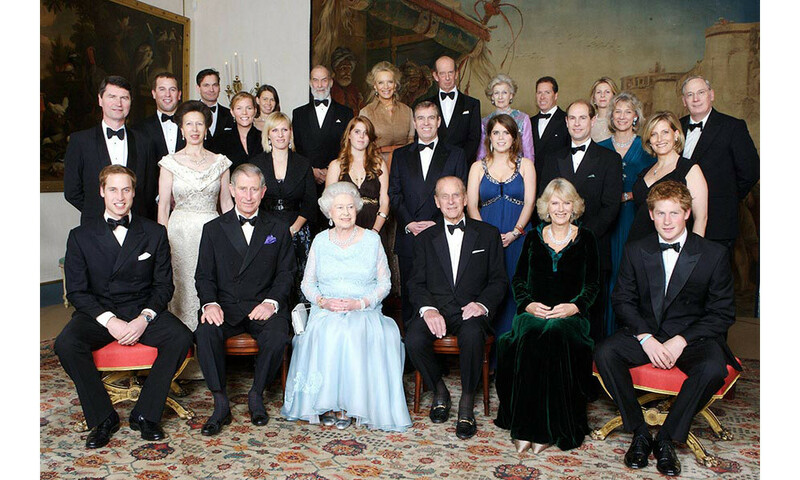 This weekend marks the Diamond Jubilee Queen Elizabeth celebrating her 60 years on the throne. There has been only one other monarch who celebrated a Diamond Jubilee, Queen Elizabeth’s great~great grandmother, Queen Victoria. The year was 1897. Even if you are not a Royal enthusiast, this is history in the making. I know it will never happen again in my lifetime nor that of my children. 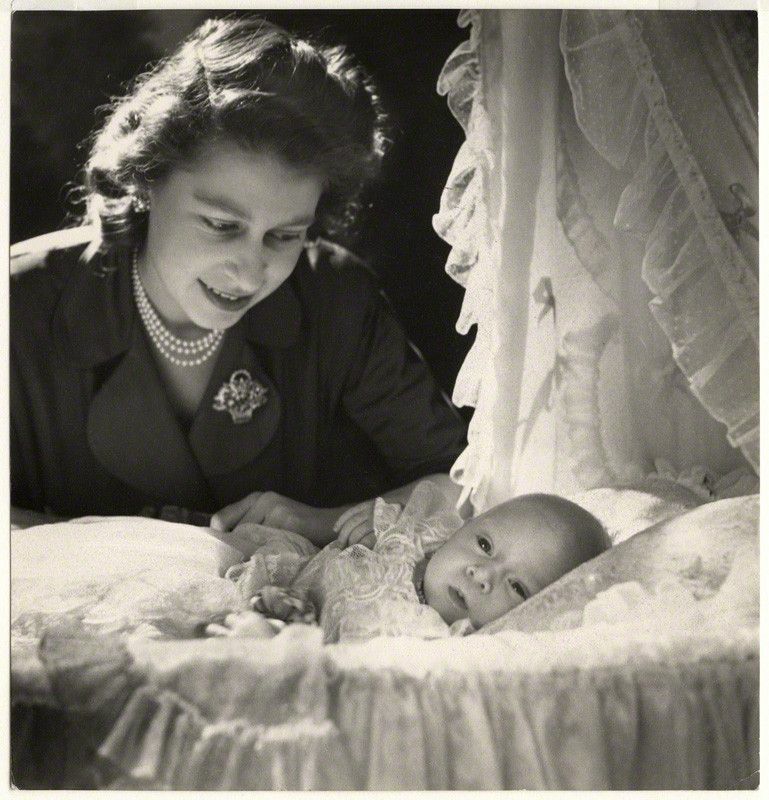 Princess Elizabeth Alexandra Mary was born on April 21, 1926. She was the first child of Prince Albert, Duke of York and his wife, Elizabeth Bowes~Lyon. She interestingly enough was born by Cesarean section at her maternal grandparents, The Earl and Countess of Strathmore and Kinghorne’s, Mayfair estate. The house sadly is no longer in existence. 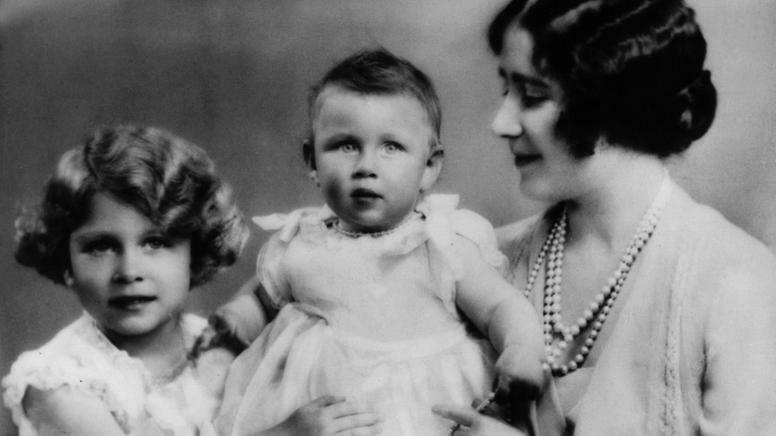 The princess was baptized in the private chapel of Buckingham Palace on May 29, 1926. 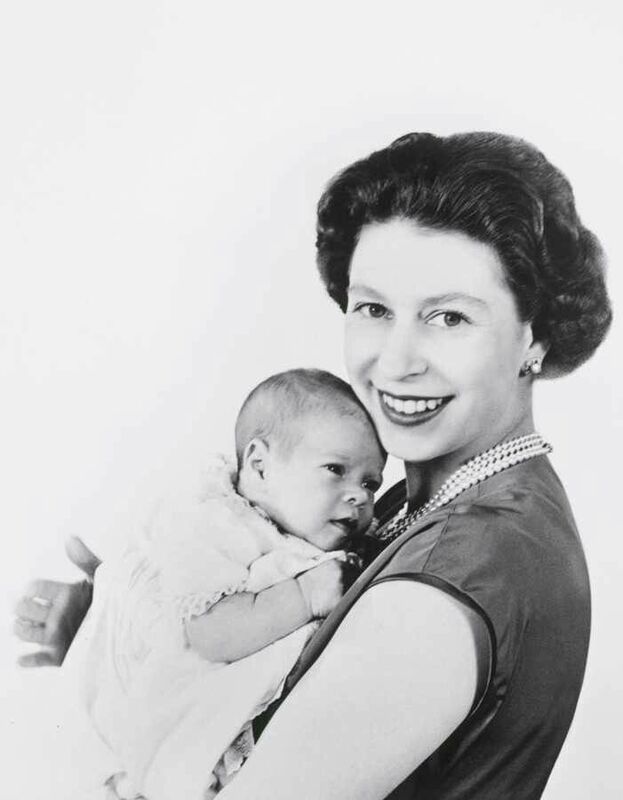 She was named Elizabeth after her mother, Alexandra after King George V’s mother, who had passed away six months earlier, and Mary after her paternal grandmother. Her full title was Her Royal Highness, Princess Elizabeth of York. Princess Elizabeth was left in the care of a royal nanny for six months as an infant while her mother and father were on a royal tour. Princess Elizabeth was not the heir apparent. It was expected that her uncle, Prince Edward~ later King Edward VIII, would reign. Because of that, she had a fairly normal, albeit royal, childhood. She is shown here at age 3. The Queen’s only sibling, Princess Margaret Rose, was born on August 21, 1930. 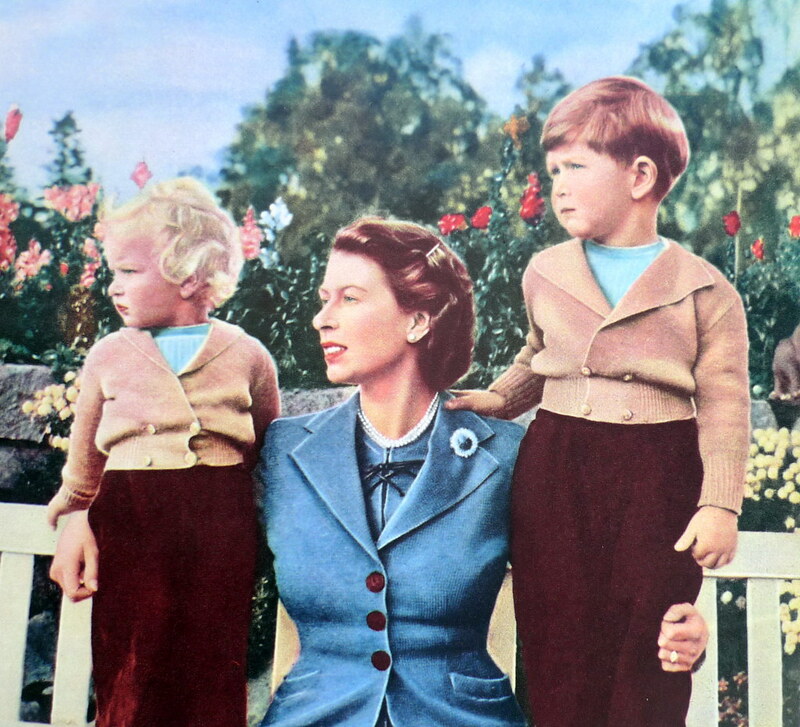 Princess Elizabeth was four years old and delighted. For the first ten years of her life, Princess Elizabeth and her sister were adored by the nation but not much thought was given to Elizabeth as ever being queen. Her father was the second son of King George V and Queen Mary. Elizabeth was merely third in line for succession to the throne. But all that changed when her uncle, King Edward VIII, famously abdicated for love and became the Duke of Windsor. King George VI’s coronation was held on May 12, 1937, the date previously intended for Edward’s coronation. This man never dreamed or wanted to be King yet famously rose to the challenge and bravely carried his nation through World War II. Princess Elizabeth was 10 years old and suddenly heir to the throne. Princess Elizabeth was educated at home along with her sister, Princess Margaret. It has been said she excelled at art, music, horse-riding and swimming. To prepare for her future role as Queen she was also taught law, constitutional history, and French. 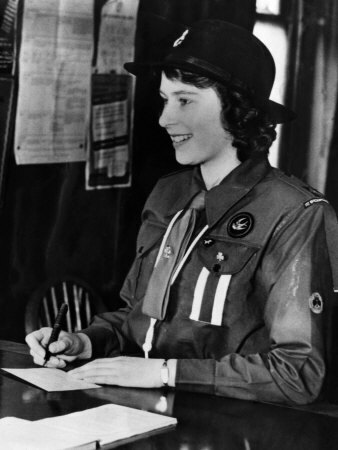 At the age of eleven a Girl Guide (Girl Scout) troop was formed at Buckingham Palace. The troop comprised of twenty Guides and fourteen Brownies. The members were all daughters of court officials and palace employees. An interesting side note was that two former members of that troop were bridesmaids at the Queen’s wedding. The Queen advanced to the rank of Sea Ranger in 1943. During the war years Princess Elizabeth and her sister were evacuated to live at Windsor Castle, while their parents remained in London. In February of 1942 King George appointed his fifteen-year-old daughter, Princess Elizabeth as Colonel of the Grenadier Guards, the senior Regiment of the Foot Guards. It was the first time in history that a woman had held the position. 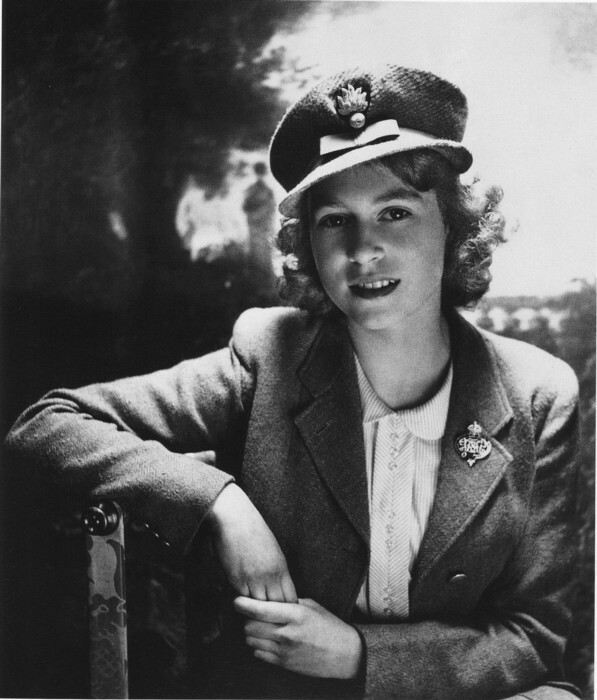 A photograph was taken by Cecil Beaton in Buckingham Palace in October 1942 which shows the Princess wearing an embroidered grenade in her cap and a blue enameled and diamond brooch, the Regimental cypher, presented to her by the Regiment on her sixteenth birthday. At the age of 18 Princess Elizabeth joined the ATS (Auxiliary Territorial Services), the women’s branch of the Army, to help out in the war effort. She was trained in vehicle maintenance and learned how to drive an ambulance. Princess Elizabeth was blossoming into an attractive young woman. She had met a young Greek prince and naval officer in 1934 as a girl at the wedding of Princess Marina of Greece and Denmark. Their long lasting friendship would soon turn to love. Although her family was rather opposed to her marrying so young, Princess Elizabeth announced her engagement to the dashing Prince Philip on July 9, 1947. Prince Philip presented Princess Elizabeth with a beautiful platinum and diamond ring which had been taken from a tiara of his mother, Princess Andrew of Greece. The ring had a total of eleven diamonds. There is a central solitaire stone of 3 carats with five smaller stones set in each side. When Philip presented the ring to the Princess it was too big and quickly had to be resized in time for the official photo. She continues to wear this ring. 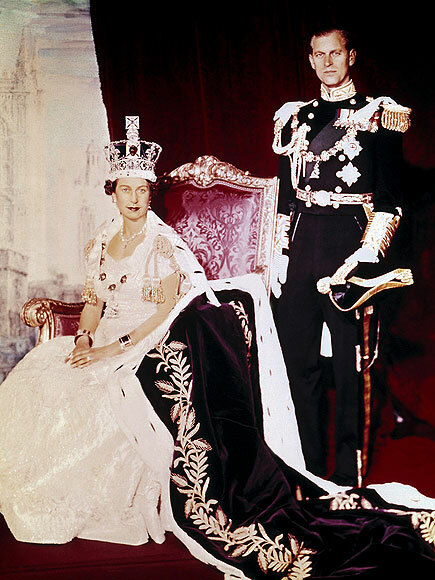 Prince Philip and Princess Elizabeth were married on November 20, 1947 Westminster Abbey in London. You can read more about the day HERE and HERE. 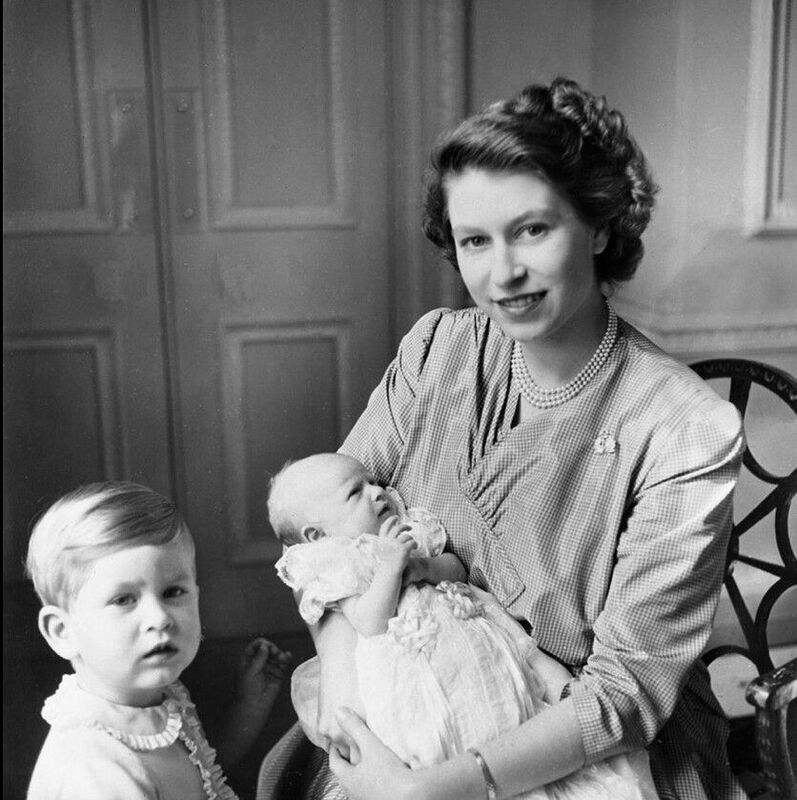 On November 14, 1948 Princess Elizabeth gave birth to her first child, Prince Charles Philip Arthur George at Buckingham Palace. The Prince would later be joined by a sister, Princess Anne Elizabeth Alice Louise, on August 15, 1950. It was a happy time for the young couple and their growing family. The Prince’s military career continued to flourish and by 1952 he had been promoted to Commander. However, his military service and their simple, private way of life would soon come to an end. The Prince and Princess had been on tour in Kenya when they learned on February 6, 1952 her beloved father, King George VI, had passed away. Princess Elizabeth immediately acceded to the throne on her return from Kenya. Her coronation was held on June 2, 1953. 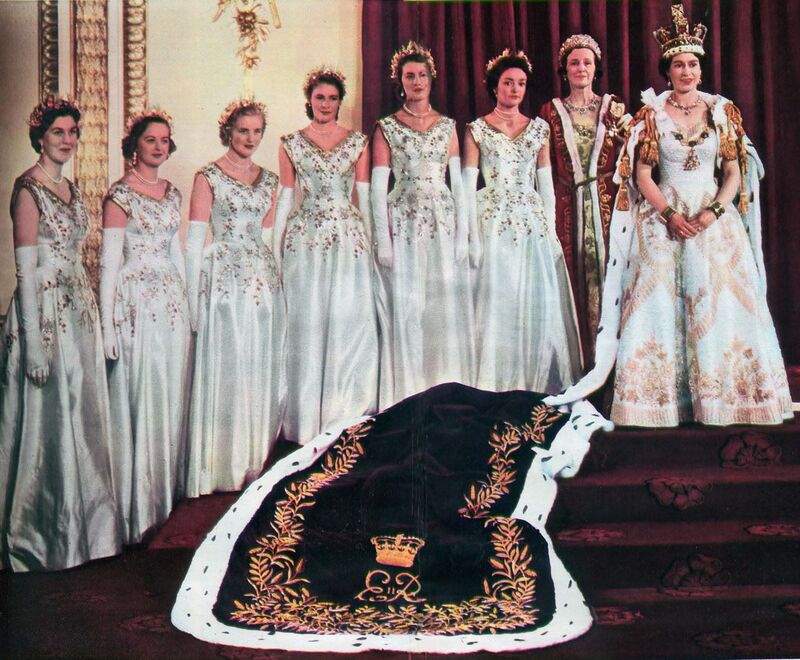 The Queen’s white satin Coronation gown was designed by couturier Norman Hartnell and exquisitely embroidered with the floral emblems of the countries of the Commonwealth. She wore the George IV State Diadem which was created in 1820 by Rundell, Bridge & Rundell for the king’s coronation in 1821. 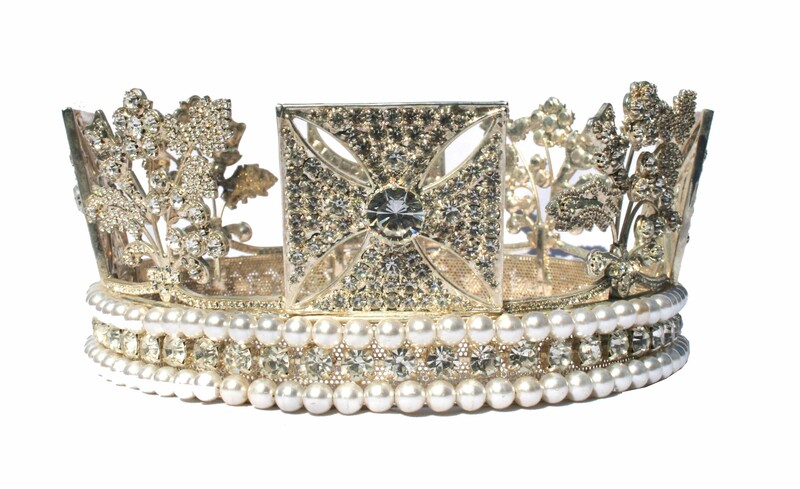 The diadem is set with 1,333 brilliant-cut diamonds and also includes a four-carat pale yellow brilliant diamond. The band has two rows of pearls on either side of a row of diamonds, above which are diamonds set in the form of a rose, a thistle and two shamrocks which are the national emblems of England, Scotland and Ireland. 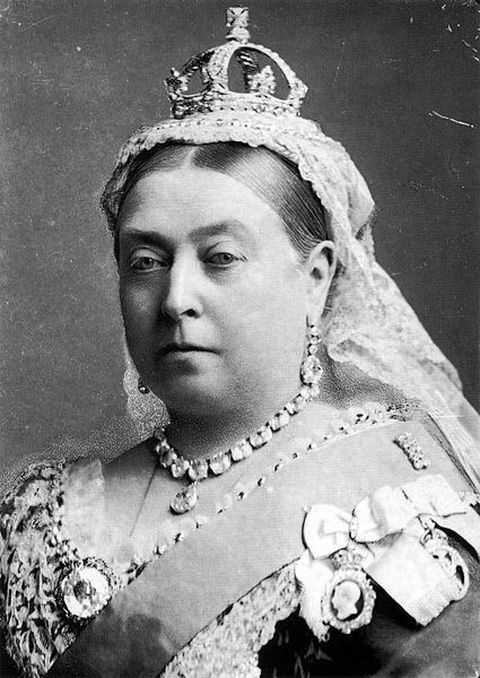 Queen Elizabeth also wore Queen Victoria’s diamond collet and drop earrings which was commissioned by the Queen in 1858 and worn by queens at each coronation since Edward VII’s in 1902. Prior to the coronation she wore the crimson Robe of State. 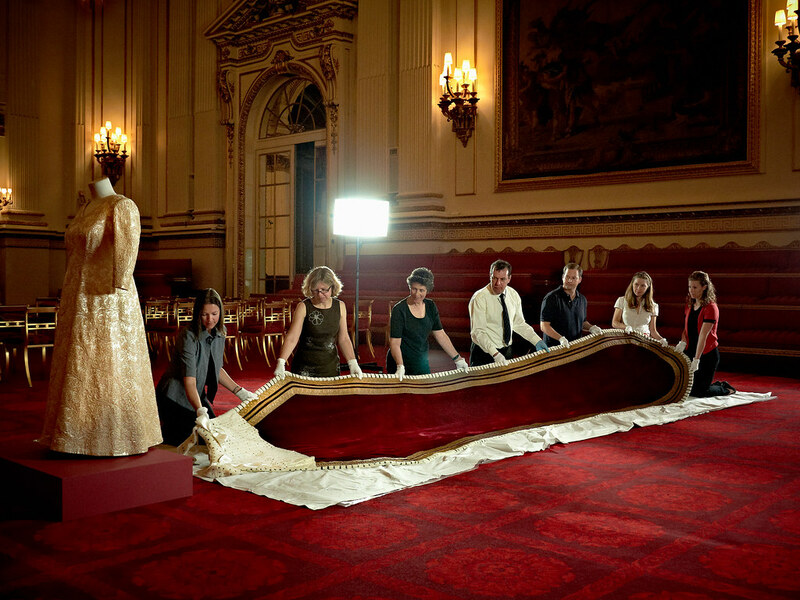 It was 18 feet long, lined in ermine with gold lace and filigree work around the edges. It weighed more than 15 pounds. She continues to wear this robe for each State Opening of Parliament. After the coronation she wore the 21 foot Purple Robe of Estate which featured an ermine border and cape with a white silk lining. The decoration on the robe comprises a border of wheat ears and olive branches, symbolizing peace and plenty. The Royal School of Needlework put 3,500 hours into the gold embroidery. It is this robe that is featured in all of the official photographs. 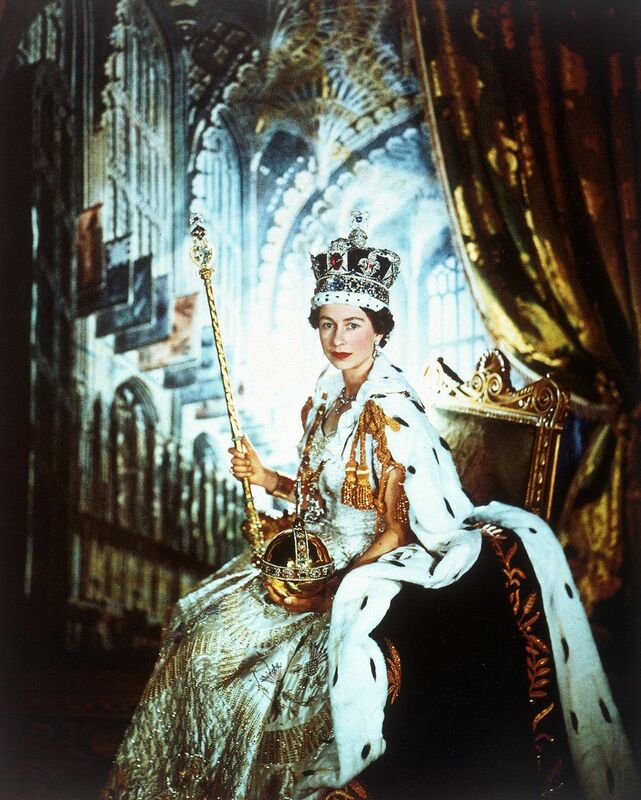 After her coronation Queen Elizabeth wore the Imperial State Crown. 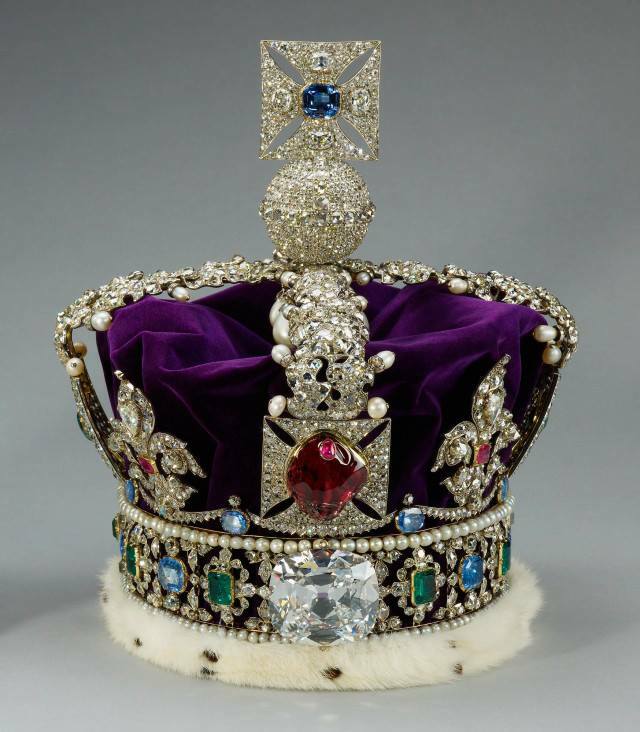 It was commissioned by the Queen’s father, George VI, for his coronation in 1937 and created by Garrad & Co. Jewelers. It features platinum, silver, velvet, ermine and over 3,000 stones to include diamonds, rubies, emeralds, sapphires, and pearls. The Queen selected six Maids of Honor, instead of pages, to bear her velvet train throughout the Coronation ceremony, it was a precedent set by Queen Victoria. From left to right, they were: Lady Moyra Hamilton (now Lady Moyra Campbell), Lady Anne Coke (now The Rt Hon The Lady Glenconner), Lady Rosemary Spencer-Churchill (now Lady Rosemary Muir), Lady Mary Baillie-Hamilton (now Lady Mary Russell), Lady Jane Heathcote-Drummond-Willoughby (now The Rt Hon The Baroness Willoughby de Eresby), Lady Jane Vane-Tempest-Stewart (now The Rt Hon The Lady Rayne). Her official portrait features the George IV State Diadem, Queen Victoria’s coronation jewelry and the purple Robe of Estate. It also documents her official throne, the imperial state crown and scepter. It was painted by Sir Herbert James Gunn in 1954. Prince Andrew Albert Christian Edward was born on February 19, 1960. He was the first child to be born to a reigning monarch since Queen Victoria. The Queen’s youngest child, Prince Edward Antony Richard Louis, was born on March 10, 1964. 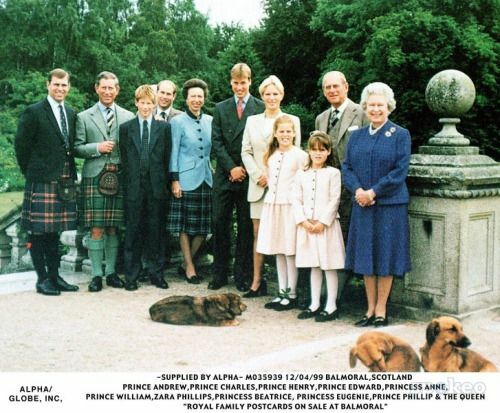 Left to right, Prince William, Peter Phillips (son of Anne) Prince Harry and Zara Phillips. 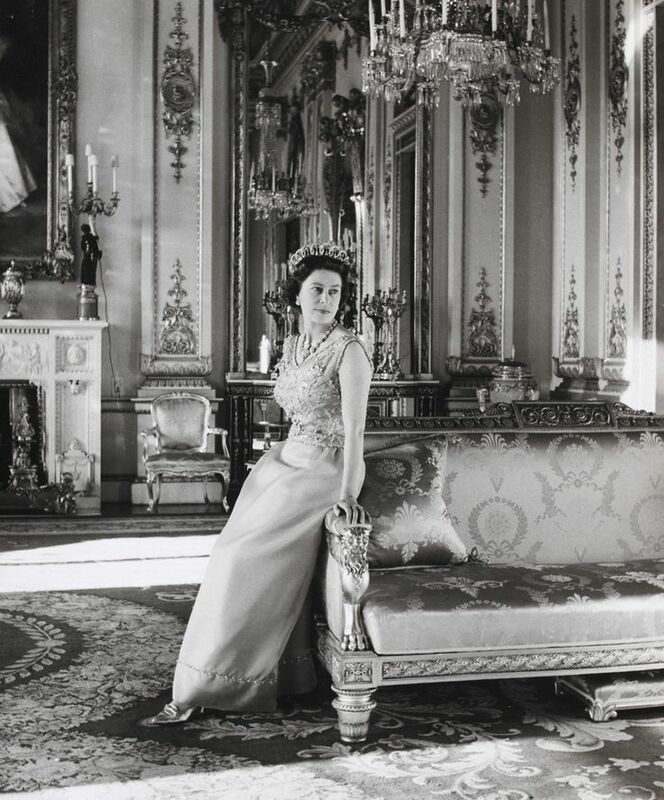 In 1968 the Queen began having her formal portrait made in the White Drawing Room of Buckingham Palace. She wore a turquoise silk sleeveless shift dress with silver floral embroidery designed by Hardy Amies. My favorite image was from a series taken by Annie Leibovitz in March 2007. The Queen is also often photographed while wearing The Order of the Garter which was founded by King Edward III in 1348. It is the most senior British order of chivalry. The Queen wears the robes of the Sovereign of the Order: the blue ribbon (or sash) and the dark blue velvet mantle, on which is pinned the Garter Star. The star comprises the St George’s Cross within the Garter, surrounded by radiating silver beams. St George is the patron saint of the Order. Throughout her 60 year reign Queen Elizabeth’s constant companion has been her husband, Prince Philip. They will soon celebrate their 65th wedding anniversary. 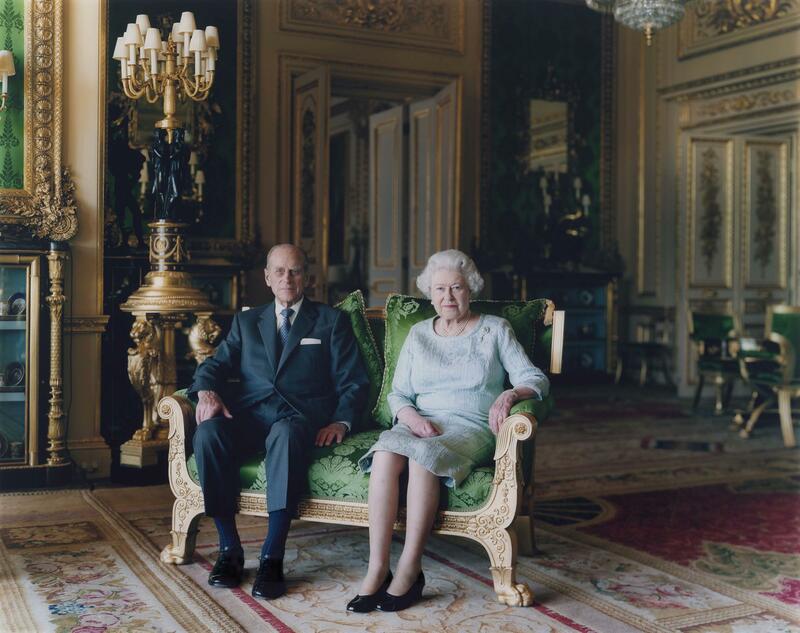 Queen Elizabeth II and the Duke of Edinburgh in the Green Drawing Room at Windsor Castle taken by Thomas Struth. 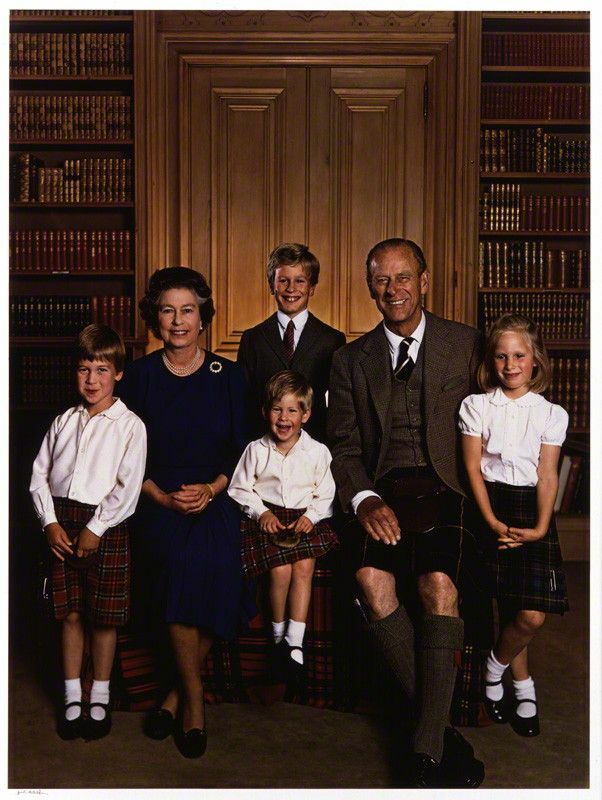 They recently posed for the official Diamond Jubilee portrait. 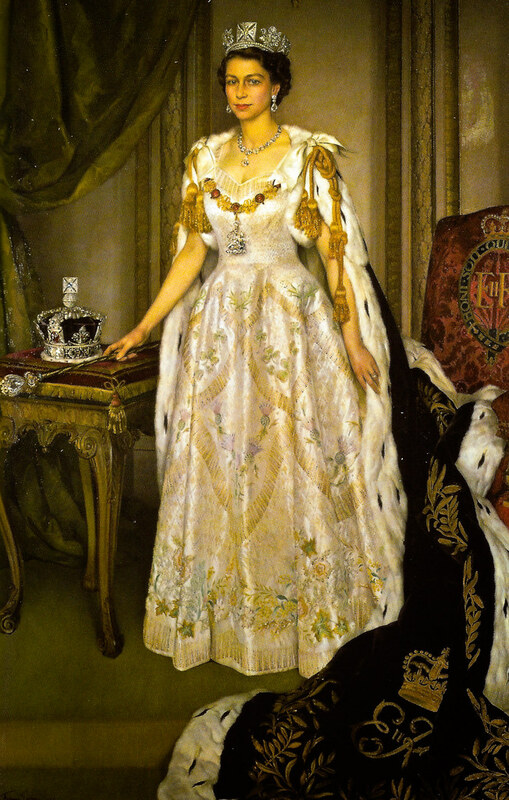 The Queen wore a white silk and silver sequin dress by Angela Kelly and the State Diadem crown – as well as Queen Victoria’s Collet Necklace. It has not been an easy reign. Not only has the Queen had to change with the world, she has faced personal difficulty and tragedy within her family. But she much prefers to focus on the next generation. 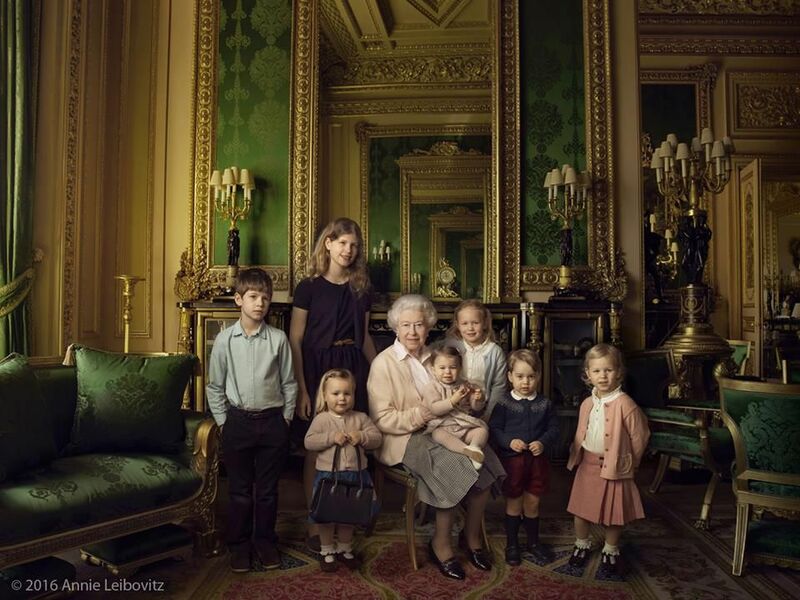 The Queen has a total of eight grandchildren which of course includes a future king, Prince William. Queen Elizabeth has indeed produced quite a legacy. For a complete listing of all the titles the Queen holds please visit this POST. Thank you for feeding my Royals addiction! Great post! Love this post..thanks for sharing a short bio of the queen. In my opinion, she was and still is a beautiful woman. I think that so many folks forget that behind that often controlled face is still the smiling young girl. I read in a biography that she used to call Philip the “Viking Price” because of his looks when she was a young teen. Apparently, she was twitterpated. I don't blame her. He was dashing. I also read that at their engagement party, they danced to “People will say we're in love”, and the way she looked at him convinced her dad to write her a letter telling her that he approved even though she was young. Anyway, I LOVE your royal posts. Thanks for the interesting post and history lesson. She has indeed become one of the great monarchs of the British empire. Not so sure about what the next generation and how he will manage. Hope he doesn't undo what she has taken 60 years to accomplish. So enjoyable and informative – as always. I'm actually on a little “unplugged” break but happened to see your post in my blog roll and had to sneak a peek. Wow what an amazing article and such beautiful photographs. Thank you for writing this for everyone to experience. God save the queen! WoW! Thanks for educating me on the queen. It was a wonderful and informative post that I'm sure took a lot of time and work. Thank you for doing the homework and sharing it! What a great post. Thank you for all the information. One question though, in the pictures of the queen, she has pieces of paper pinned under the broaches, do you know what & why they are? Thank you for sharing this post. Queen Elizabeth is such a beautiful woman, and her photographs often do not do her justice. I admire her strength. I can't imagine living life in a “glass house” as she has done. You are Supercalifragilisticexpialidocious. Thank you for this informative and interesting post. Before reading this,I knew more about her children and grandchildren. This was an incredible post. I enjoyed your detailing the pictures and explanations, now I know the “Why and wherefore”. Really great. Thank you. By the way I love your June header. You captured my favorite color, turquoise. Beautiful post Laura… just loved reading more about her!! She was engaged on my Dad's first birthday! Laura, what a fantastic post! I am more than proud of my British heritage, especially this weekend. I really enjoyed reading this, and the photos you selected are wonderful. I'm putting up my Union Jack when I get home this afternoon, and tomorrow we'll have afternoon tea to celebrate the Jubilee. This was a WONDERFUL post! I sat my children down and we went through the whole thing like a home school history lesson. Great fun. Thank you for posting this. Hope you are having a good day and all is going well with your move. Fascinating post! I learned things I did not know. Thanks! Such a beautiful post Laura! It always seems to me that the Queen never changes. Her hair has grayed but her style is dateless. I remember her passing the end of my Street in her black Rolls Royce during her Silver Jubilee tour when I was ten. I waving my little flag like crazy. Thank you so much, Laura, for this delightful & well presented piece of history. The pictures are just beautiful! Sooo interesting! My European heart is beating faster as we speak! What a wonderful tribute to an amazing woman. Maybe not ever decision she has ever made has been perfect but she is an extraordinary person. She is one that any girl could look up to, not because she is royalty but because she is smart, strong and confident. It is a very good post, almost a documentary! Queen Elizabeth and my Mom were born at the same time, were married the same year and I am the age of Prince Andrew. So I think of my Mom, my Mom was my Queen in my eyes. Laura, thank you for this wonderful, informative post! I am facinated by the royals and enjoyed reading all about the Queen. She is an amazing woman! I learned so much about her that I did not know. Great pictures too! Let the Jubilee celebration begin!!! Hi Laura! Thank you so much for this interesting history lesson. Your pictures you choose are always inspirational. I'm gearing up for my 3rd annual WEDDING BLOG PARTY next Friday (June 8th) and would so love it if you could join us! Please stop by and read all about it! Laura isn't it so interesting to look back at what a lovely, young queen she was! Truly beautiful and elegant! I adore your description of her Royal attire and Crown Jewels! SO HAPPY you and I share a ROYAL LOVE AFFAIR!! !I loved your POST, read it and re-read it!! !She is amazing and I think what she does deserves a BIG WEEK or YEAR of celebrations!! !I doubt NO Monarch will see 60 years…….Charles will not…William could if he becomes KING SOON…and that is NOT going to happen….. So I say LET'S Witness HISTORY!!! Fascinating post. Thank you for compiling all of this information. What a fun read! Dear Duchess – What a fantastic post! Love the history and the closeups on the crowns and other jewels. I had no other way to contact you so I am hoping you will come back here. The pieces of silk that Her Majesty wears under two of her brooches are to help support the weight and protect the dress.